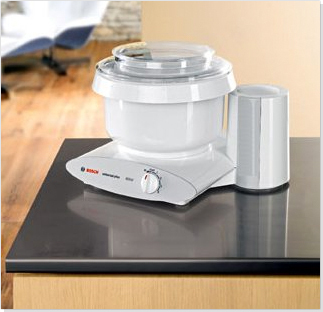 The Bosch Universal Plus is the chefs ultimate secret weapon in the kitchen. We’ve used this mixer, and we love it! The Universal we’ve had for years has been, and still is, a terrific machine… and this one is substantially better yet! The price point is a little higher but that’s how costs typically go, and in this case we’re getting more for the extra dollars. The Universal Plus incorporates many features we’ve wanted for years, AND more that we hadn’t asked for — or even considered. New Styling: A member of the Porsche design team collaborated with Bosch on this exciting new look. It’s fresh and dynamic, and one of the things we like best about it is that it retains the unique “iconographic” shape that has long distinguished the Universal from lesser machines. We think it’s a big winner. Higher Capacity: The rated bowl capacity is 6.5 quarts. We’d call that its “air” capacity, though we should describe it as 5.5 quarts usable capacity. A more practical measure is that we’ve rated the old bowl at 12 lbs. of dough, and this one should hold 15 lbs. because its lid has much better “crown” than the old one. 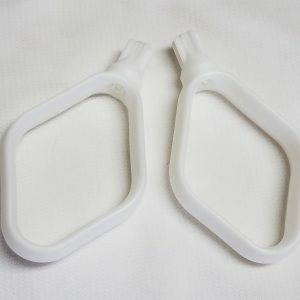 Also, the splash ring has four locking tabs rather than three, and it has a “holding” tab that keeps the splash ring from wiggling loose. Enhanced durability: It’s surprising to be talking about a “more durable” Universal, considering that they’ve already seemed to last like Methuselah compared to other mixers. But accelerated load testing by Bosch shows that the motor of the Universal Plus will now last four times longer than in the past, and the transmission will last twice as long as the one in the former Universal under heavy kitchen use (the kind of use most Bosch users give their machines.) Universals have been lasting 15-20 years… multiply that times two and we seem to be looking at a machine with a drive train that virtually cannot be worn out. The extra years of life that Bosch has engineered into this machine much more than make up for its additional cost. Locking Bowl: Finally, this bowl locks onto the base of the mixer. The bowl also has a generous grab-lip. You can lock the bowl on, lift up on it, and securely lift the whole mixer into the air. But to do so, you might want to slide it off the edge of your counter, because the Universal Plus has suction feet! Between the stability that the locking bowl adds, and these nice suction feet, the days of movement on the counter should be long gone. Same Accessories Fit: Your old accessories will fit onto the Universal Plus. That goes for both the bowl attachment drive, and the blender attachment drive. So you can upgrade to the Universal Plus, and not have to replace any of your accessories. Higher Performance: The motor has been boosted from an already-strong 700 watts, up to 800 watts, but its power output has been increased even more than the 100 watt difference would seem to indicate, because it has a more efficient design. Remember, wattage really is not an absolute measure of power — it’s a measure of electric consumption. This 800 watt motor is more powerful than most motors with considerably higher wattage ratings. More Speed Choices… Plus a wider speed range. This machine has four speeds (plus pulse), rather than three speeds. And it has a slower Speed 1, and a higher top speed. Dishwasher-Safe Whip Drive: The new whip drive cap is plastic, rather than aluminum. The whip axles are still stainless and are now molded into the drive cap, so they won’t pull out as could sometimes happen in the past. Washing the old aluminum version in a dishwasher would turn it dark gray very quickly, but that won’t happen to the new one on the Universal Plus. Easy Cleanup: The drive shaft is removable!! In two seconds you can pop the drive shaft assembly out the bottom of the bowl! This is a big help when you need to clean up on those occasions when dough gets into the center column. New Blender: A new blender design incorporates the superior performance of the old blender, and now includes a lid safety lockout that prevents operation of the motor unless the blender lid is installed. The lid funnel is much larger, allowing big ice cubes to be added with the lid in place. When the blender is not installed, the safety cap must be installed over the high speed drive or the motor will not run. 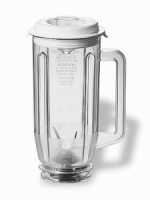 This new blender is not yet available, and we don’t expect it to be available until sometime in early 2008. Hidden Cord Storage: Excess power cord now stores in a hidden cavity. For more than five decades, premium manufacturer Bosch home appliances part of BOSCH Home Appliances Corporation has been perfecting its revolutionary countertop appliances, and now unveils its most versatile secret weapon for the kitchen: the Universal Plus Kitchen Machine. As the newest member to Boschs family of high performance small appliances, the Universal Plus is the ultimate stand mixer that offers high performance, multiple safety features and a striking new modern design. Having added a powerful 800-watt motor and an upgraded version of its legendary automatic transmission drive system, the Universal Plus is leading the next generation of Bosch Kitchen Machines that combine multiple countertop appliances into one easy-to-use unit…offering home chefs a smart investment. Offering the ultimate in versatility, the Universal Plus is compatible with a wide assortment of accessories, including accessories from the existing MUM6 Kitchen Machine Series. Whether you need a meat grinder, food processor, blender, or even a juicer, the Universal Plus is a multi-function kitchen machine. 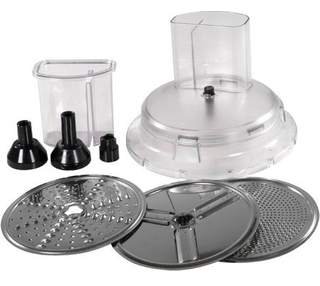 Cleaning is just as easy as preparing food, with removable dishwasher safe parts and accessories. **The Blender is now made with TRITAN Co-Polyester!